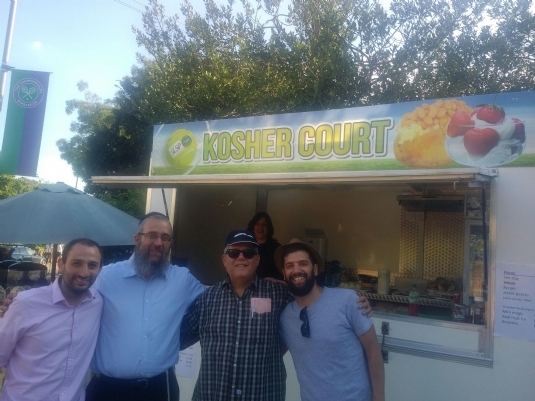 For the 10th consecutive summer, Rabbi Dovid & Sora Cohen of Chabad South London Students & Young Professionals, have been running their Kosher Court takeaway at the Wimbledon Championships. With glorious sunshine there has been no shortage of hungry customers coming from all over London and as far afield as Manchester, New York and Virginia with the Cohens serving up to 100 people each day. Almost at the half way point of Wimbledon fortnight there is still plenty of time to come and grab a kosher bite as well as some Strawberries & (parev !) Cream so check out the details below or even pre-order your meal on 07801 491 386. Enjoy the tennis and have a Shabbat Shalom from Wimbledon! WATCH THE KINUS BANQUET: LIVE! Chabad Lubavitch UK - 020 8800 0022 - Charity Number 227638 - Trustee Corporation: Lubavitch (UK) Ltd.